Here you'll find durable pulse and sports watches adapted for training. 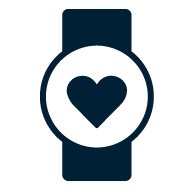 Many models have a built-in heart rate monitors or pulse band support, can be connected to the mobile phone to display messages and receive calls, and have built-in GPS. Choose in the filter which built-in features you need, if you want a colour display and if the model should be completely waterproof.